If you want plenty of space with your SSD, this is the hard drive to get – but be prepared to spend a lot of cash on it. The Kingston 1TB SSDNow KC400 is a hard drive that sets out to change perceptions. It’s long been assumed if you want impressively fast data transfer rates you need an SSD (solid state drive), as the lack of moving parts means it’s not relying on how fast a disc can spin to get at your data, but if you want large storage capacity, a traditional hard drive is the way to go. For many people the way around this was to have an SSD dedicated to booting the operating system and some core programs, with a second larger HDD for storing files and programs. Not ideal, especially for laptop owners who can only fit in one 2.5-inch drive into their device. The Kingston 1TB SSDNow KC400 eliminates this problem in some aspects by including a very large 1TB of capacity into a single 2.5-inch SATA 3.0-capable SSD drive. We say ‘some aspects’ as there is still a big reason why large capacity SSDs won’t be suitable for everyone – price. The Kingston 1TB SSDNow KC400 costs around £320 (around $400, AU$520), which is pretty steep when you consider that a regular 1TB hard drive can be had for as little as £45 (around $55, AU$75). So while the Kingston 1TB SSDNow KC400 tries to solve the conundrum of whether to have speed or capacity, it introduces a new one: is that combination worth the expense? The Kingston 1TB SSDNow KC400 is the latest drive in Kingston’s SSDNow line of products, and it also comes in 128GB, 256GB and 512GB capacities. It features a Phison PS3110-S10 8-channel controller and quad-core processor, which Kingston claims makes it 15 times faster than a standard hard drive. The KC400 SSD is geared towards business use with end-to-end data path protection and SmartECC flash controller technology from Phison, which protects against NAND wear-out and protects data against unexpected power loss. To further protect your files, SmartRefresh tools rebuild data if there’s an error, and Kingston provides a free downloadable SSD Manager software application to help manage and monitor the SSD. A five year warranty with free technical support is included, and the MTBF (Mean Time Between Failures) is 1 million hours. Kingston is pretty confident that the 1TB SSDNow KC400 is a highly dependable hard drive for storing important files. 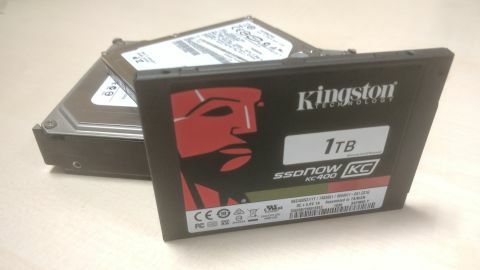 As well as the £320 (around $400, AU$520) Kingston 1TB SSDNow KC400, the 128GB version costs £60 (around $70, AU$100), the 256GB version costs £100 (around $125, AU$165) and the 512GB version costs £160 (around $200, AU$260). All capacities have pretty much the same features, though the lower capacities are capable of slightly faster read and write times, which means if you want to save money by getting a smaller capacity, you’re not sacrificing anything else but disk space. According to Kingston, the 1TB SSDNow KC400 has sequential read/write speeds of up to 550 and 530MB/s respectively, and in the CrystalDiskMark benchmark tests we ran, which measures read and write speeds, the 1TB SSDNow KC400 actually surpassed it with 560.8MB/s read and 536.6MB/s write speeds. The ATTO benchmarks provided similarly rosy results, as it tested the read and write speeds of the drive using increasingly large files. The drive’s speed was pretty consistent at around 560.4MB/s read, 532MB/s write. These raw numbers makes the speed difference between a HDD and SSD clear. Our recent review of the Seagate IronWolf 10TB sang its praises for reaching read speeds of 250.2 MB/s and write speeds of 229.2 MB/s, which is undeniably impressive for a HDD, but less than half the speeds of the Kingston 1TB SSDNow KC400. In our real-world test, where we moved a 6.5GB file onto the KC400, it took 1 minute 34 seconds to complete. This is pretty impressive, though not that much faster than a standard hard drive’s results of 1 minute 38 seconds. Of course, the bottleneck here is probably the standard hard drive the file is being moved from – if we were transferring the same file between SSDs, the results would likely be lower. We also ran PCMark 8 benchmarks which delivered a score of 4959, scoring higher than the Crucial BX100 SSD (which got 4814), but lower than the Samsung 850 Pro’s score of 5042.